41 Best Men’s Weekend Bags | Genuine Leather, Spacious, Highly-organized! Not all business or vacation travels demand you to bring a suitcase. There are those overnight, quick excursions, or weekend trips that calls for just that – a mens weekend bag. Read on to learn more about this stylish, functional carryall bag. What are Men’s Weekend Bag and Why Do You Need It? Weekend bag or known also as a weekender, overnight, or duffel are bags intended for carrying short travel necessities such as clothes, toiletries, and other essentials. In detail, duffel bags come from canvas material and typically sport a cylindrical shape and shoulder straps. On the other hand, the weekender or overnight bags ordinarily feature a rectangular shape. Though customarily modest in size, however, roomy enough to carry a day or two’s worth of weekend basics. To put it another way, a genuine mens weekend bag is not only compact but also instantly packed away. It must be likewise allowable as your carry-on for those brief commercial flights. Normally, the materials used for this kind of travel bags are canvas, nylon, leather, or oftentimes a blend of those mentioned. Now, why do you need a mens weekend bag? Converting your backpack or wheeled suitcase to a weekend bag provides you with a stylish and timeless look. In short, the weekender is your trendy upgrade to the standard backpack and wheeled travel luggage. Right now your job may not involve business travels; however, keep in mind that the weekend bag is likewise fabulous for those unscheduled or out of the blue excursions. If you are still apprehensive about shifting, here is our round-up of mens weekend bags to guide you in choosing the perfect weekender for you. A handmade weekender produced from waxed canvas. Aside from that, it features a leather strap, cotton lining, and saddle leather. This exceptional Mens Travel Weekend Bag is fit for gym use or short trips over the weekend. With frequent use, you will notice that the shade improves over time. Had too much fun in your trip that you now have extra baggage in your hands? That is not a problem with the Expandable High-quality Canvas Weekend Travel Bag. Made from superior soft nylon canvas, you can carry your extra baggage in its two expandable side pockets. Although, pretty sure since it already has eight compartments bringing home another round of extra packages will not be a dilemma. Spending a holiday weekend out of town is necessary to relieve those tensed nerves from work. 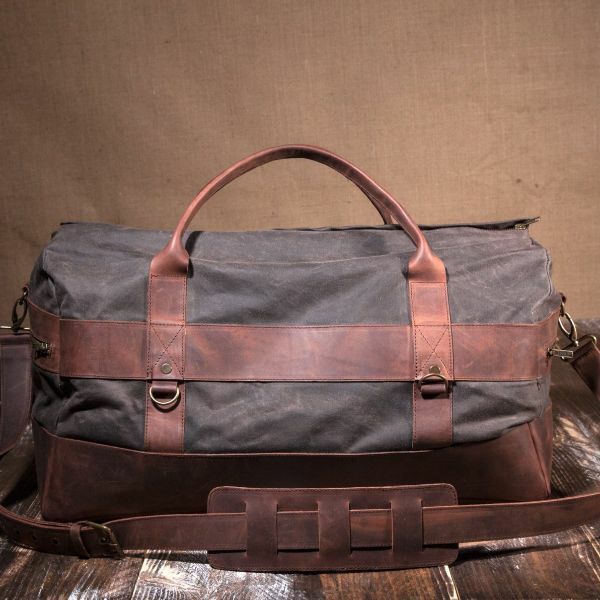 You’ll be sure to unwind and enjoy your quick trip with this Weekender Waxed Canvas Bag. With its robust waxed canvass material, your fragile belongings are certainly secure inside your bag. Whether you are traveling for business or pleasure, it’s more memorable when you do it as a couple. For this reason, why not go on a trip with a matching Couple Canvas Weekend Bag? Available in small or large size, you can even carry this couple’s bag during a brief outdoor trip or a sudden visit to the gym. Nevertheless, with this weekender, you are sure to keep your necessities safe on the move yet having spectacular style. Besides your personal use, this Brown Organizer Weekend Bag is a fantastic gift for your loved ones. You can make your gift more remarkable by requesting to personalize the bag. Constructed from canvas and PVC leather, this weekender likewise showcases soft handles, detachable, and adjustable straps. Get in touch with your feminine side with this Cute Ethnic Floral Weekend Bag. Including this weekender in your travels will absolutely keep you coordinated during your whole trip. It features five compartments plus an anti-theft back pocket for added security. If flowers are cool enough as a tattoo, why not flaunt a Floral Weekend Bag? Here is a weekender we recommend for those who prefer a bag with a touch of vintage style. This waxed cotton mens weekend bag offers waterproof nylon compartments, adjustable back straps, and leather buckle fastening system. Whoever says plaid is only for women has definitely not seen the Plaid Small Weekend Bag. 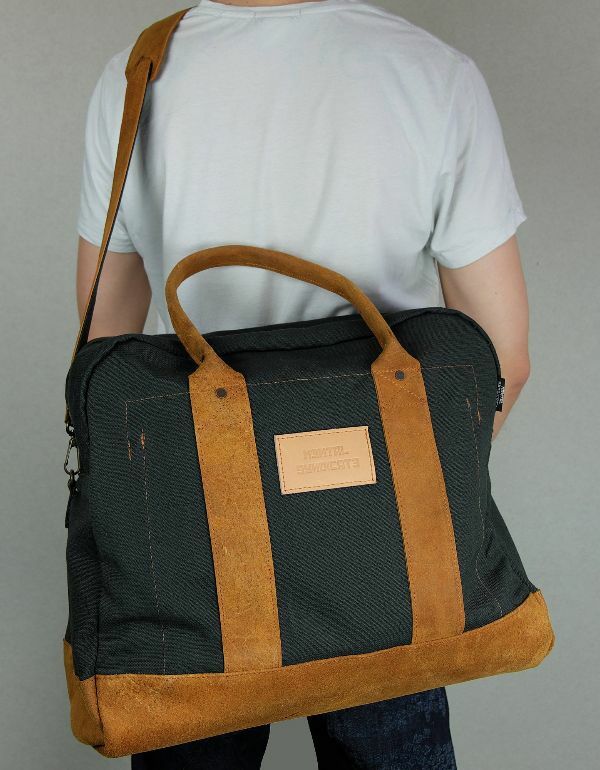 The chic blend of leather and plaid canvas allows this bag suitable for men. Its two compartments ensure that you can stow your weekend basics inside the bag. Always remember real men rock plaid! In case your eyes are set on a weekender with Ethnic woven fabric, we have for you the Ethnic Canvass Weekend Bag. A delightful handmade creation, it provides 2 side pockets, black canvas interiors, and internal pockets suitable for a mobile phone. If you are searching for a men’s weekend bag with leather accents, then look no further. The Large Vintage Weekend Bag has premium leather accents and is available in five different colors. Any rich vintage variant you select is highly compatible with your casual or corporate attire. With its six compartments, you will never run out of areas to store your belongings. Business travelers requiring a weekender with a space for laptop or tablet must have the Premium Leather Suit Laptop Weekend Bag. It has a timeless look owing to its authentic full-grain thick leather and finely detailed magnetic buckle for pockets. With its nine compartments, travelers will not have a trouble with space; it likewise features a large slip-on open internal pocket for tablets and an anti-theft back pocket. Needing an extra large mens weekend bag? As can be seen below, this Overnight Leather Weekend Bag produced from full grain cow leather is just what you need. Since it is handmade, each bag is distinct and you will find the colors and leather differ in every product. When we mentioned earlier that the weekend bag is your upgrade to the standard backpack, one of the timeless replacements we have in mind is the Stylish Leather Travel Bag. Produced in superior quality leather, having this mens weekend bag on your shoulder guarantees you will walk with flair and style. Professional and structured, those are the words that come to mind when you first glance at the Business Weekend Bag. With its sturdy leather structure, it enables the weekender to sit up straight in place, however, still comfortable to take with you in your travels. Nonetheless, owning one of this mens weekend bag will make you completely organized for your business travel. Looking for a classic weekend bag? Then what you are seeking is the Sleek Overnight Black Weekend Bag. It surely is a thing of beauty with its simple, black, elegant finish. You will never run out of pockets to place your essentials with its five compartments. Furthermore, it boasts of comfortable handles, precision-sewn traces, and strong leather straps for the utmost durability. A garment bag made from vegetable tanned leather, in time and with continual use the material will soften and adopt a lovely patina. Additionally, this handcrafted weekender features a YKK zipper, cotton/denim lining, and detachable shoulder strap. Function and fashion all in one weekender that is how one can describe the Genuine Cowhide Leather Patchwork Business Weekend Bag. Designed with authentic full-grain cowhide leather, this travel bag showcases an exquisite leather patchwork. Men can easily pair this weekender with any ensemble from business casual to everyday clothing. All the same, it has five compartments roomy enough to store your various essentials. As we all know, leather improves with age. Obviously, this Italian Leather Weekend Bag is certainly not an exception. Stylish yet functional, the Italian Leather Weekend Bag is a convenient weekender to carry in your travels. In the meantime, those hunting for a mens weekend bag that is fit for everyday use can grab the Overnight Waterproof Italian Leather Weekend Bag. Crafted with superior quality waterproof leather this weekender can endure the wear-and-tear of regular use. In fact, stitching around the body was reinforced to add to its sturdiness. In this case, the gray leather in this mens weekend bag offers it a vintage effect. Moreover, the matte leather likewise enables imprints on the weekender which allows you to create memories from all your travels. To maintain its superb quality, apply wax balm monthly. Surprisingly, the Genuine Full-grain Leather Quilted Weekend Bag is a weekender that is comfortable to carry on your shoulder without compromising your style. This quilted sleek design is handcrafted to perfection and has three compartments that can secure your belongings. That in there we can say you’ll be traveling with confidence when you bring the Leather Quilted Weekend Bag with you. In a word, this Elegant Style Vegan Weekender Bag is straightforward and practical. You can quickly access its main compartment with a zipper. Surely, this no-frills weekender is a must have. Meanwhile, environmental advocates should not feel left out! Here is the Vegan Faux Leather Weekend Bag made from vegan eco-friendly leather. It has four compartments, firm leather handle, and removable strap for quick conversion to crossbody bag, handbag, or shoulder bag. Men traveling with this weekender will absolutely feel eco-elegant! Active travelers can immediately grab and go with the Airport Roller Weekend Bag. This innovative weekender can be readily converted from a shoulder bag to a rolling mens weekend bag. Granted that it has wheels, still, you can take it as a carry-on in your flight. Can’t decide on what to bring on your weekend trip? When you purchase the spacious Canvas Leather Suit Weekend Bag packing all your essentials will not be a problem. It boasts of long-lasting geometric polyester internal lining that ensures this weekender’s toughness. Moreover, it has a thick hand-carry strap that allows for comfortable, hassle-free carrying. Another classic entry is the Black Genuine Leather Rolling Weekend Bag. This weekender is a pro in giving the impression that you are packing light but in reality, your bag is fully packed! Also, you can be sure your belongings are safe with its sturdy polyester internal lining and premium smooth zipper. The Fold-able Rolling Waterproof Weekend Bag is your option if you are searching for something affordable and waterproof. What is unique about this model is that you can fold it the same size as a notebook. This is perfect to bring on your trip as a back-up weekend bag when you are certainly planning to bring extra baggage upon going home. While leather is the foremost choice when it comes to quality, however, the cost is lavish to some. Thus, included in our round-up is the affordable Personalised Tweed Weekend Bag. A handmade weekender constructed from tweed, this bag is fit to use whether you are dressed up or dressed down. The Travel Garment Carry on Weekend Bag is your optimum travel companion. It offers six compartments, a quick-access front outer pocket, and a huge back pocket suitable for devices such as laptops and tablets. Whether you choose the black or gray variant, we can guarantee that this weekender will always look superb as you do. Sports enthusiasts will delight for sure with this Weekender Overnight Bag. Made from sturdy water-resistant nylon, this mens weekend bag is both compatible for travel or gym use. Carrying it likewise is not an issue since it comes with a removable and detachable strap that promptly converts your weekender to either a backpack or shoulder bag. If you are not fond of leather, you can opt for the Waterproof Nylon Weekend Bag. It is a weekend bag that can likewise work as your sports or gym bag. This weekender has five compartments, detachable adjustable straps for quick conversion, and dual zipper which allows you to put a lock for extra security. Travelers whose priority is comfort must check out the Monogrammed Quilted Weekend Bag. Though featuring long-lasting black polyester, this mens weekend bag ensures your convenience while traveling with its comfortable and hassle-free handles. Are you wary of thieves ready to jump on you anytime? Created to outsmart thieves is the Anti-theft Carry-on Weekend Bag. It showcases eleven compartments, free anti-theft lock, five sturdy plastic stands for utmost protection, and an anti-theft back pocket for your precious belongings. Compared to the other mens weekend bags this weekender is a four-in-one bag. You can immediately convert it into a backpack, cross body bag, handbag, or shoulder bag. Notably, this weekender will be an excellent addition to your bag collection. As regular travelers normally face a heavy downpour during trips, your belongings will surely be protected with this waterproof mens weekend bag. Complement your contemporary look when you travel with this handsome Navy Weekender Bag. For an convenient and comfortable travel, you can either carry your bag as a handbag or a shoulder bag. This rugged linen-like polyester weekend bag is ready to use for your active and busy lifestyle. On one hand, if you are aiming for the casual look on your business travel then the Ultimate Disaster Design Army Weekend Bag is the one for you. Constructed of superior waterproof nylon canvass, it includes nine compartments, rugged polyester internal lining, and an anti-theft back pocket. When you travel with this weekender, you will naturally stay organized in style. A sudden overnight or business trip requires only a Small Travel Weekend Bag. For your work needs, this authentic full-grain calfskin weekender can accommodate your 13″ laptop. Furthermore, if you need to travel by plane you can absolutely bring it as your carry-on baggage. Most men prefer that their personal belongings are of the less maintenance kind. Substantially, choosing their weekend bag is not an exception. If you are searching for that perfect gift for your trendy husband, boyfriend, or brother then we suggest getting them the Camouflage Military Duffel Weekend Bag. Showcasing a dark camo design, this weekender demands low maintenance and cleaning. Crafted from superior quality waterproof nylon canvas you can totally travel with this dependable duffel bag. Do you love spending your weekends outdoors? Then you must see this take-anywhere Multifunctional Weekender Bag. It’s a bag you can use four ways, as a chair, mat, hanger, a shoulder, or crossbody bag. If you enjoy biking, it likewise has slots at the bottom where you can place your bike tail lights. Frequent travelers will doubtlessly experience traveling in extreme weather. For these unfortunate events, a waterproof mens weekend bag is highly optimal. Truly, this is where the Lightweight Duffle Weekend Bag comes in. With its superior quality Oxford cloth, this duffle bag can survive any weather and sports situation. Indeed, this Water Resistant Canvas Weekend Bag is your capable travel companion. Whether you are going on a short trip to the gym or a quick out of town getaway you can be sure your essentials are safely packed away. Since you will be traveling with your weekend bag, the durability of the material is a top priority. For a bag’s exterior, waterproof canvas or nylon is a smart choice. If you are seeking for something with a little class and sturdiness, opt for leather handles. Before making a purchase, examine well the bag’s stitching, quality of the leather, and material used on the zipper. Ensure these areas are robust; otherwise, you’ll soon encounter dilemmas. For business travelers, dark colors are always safe. Same as opting for navy blue color for your weekend bag. Remember light colors appear much sportier. 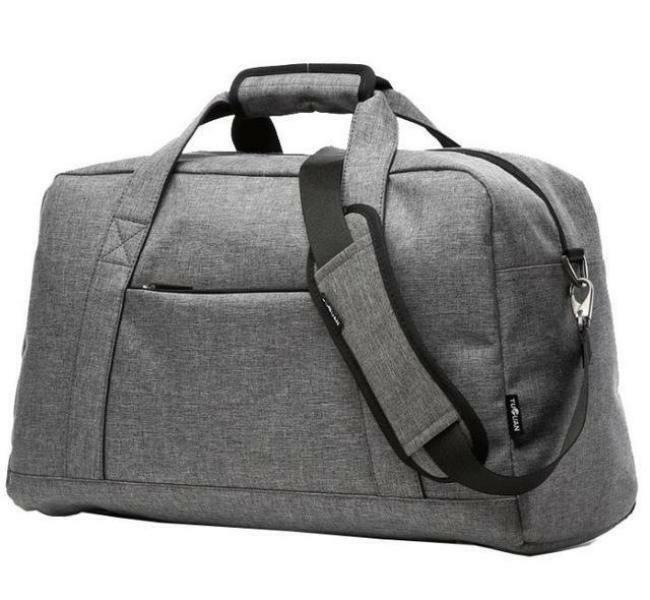 As mentioned earlier, a men’s weekend bag must be compact to fit in a commercial flight overhead compartment. Likewise, it should be able to carry a doubled-over coat at the bottom but still have space enough for your other weekend basics. Again, as a traveler, you must have sturdy straps long enough for you. Men on the lanky side can likewise purchase their own strap for a much longer option. The weekender will lose its classic style if it’s positioned all the way up your shoulder blades when you use it as a cross body bag. Ultimately, in selecting your men’s weekend bag the top-most factors to consider are material and quality. 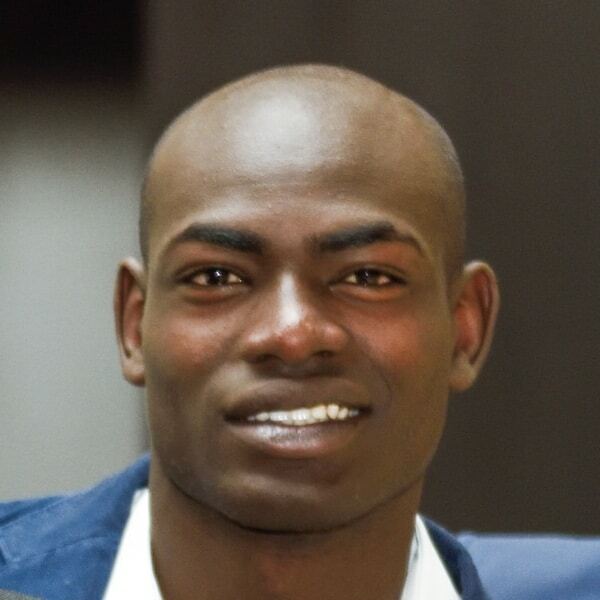 Keep in mind purchasing from a known brand is irrelevant if the product is of low-quality. If you find yourself a well-crafted weekender, buy it then don your sunglasses and trusty blazer and enjoy traveling!